As part of the Battle of the Somme Centenary Hull Philharmonic Orchestra conducted by Andrew Penny accompanied the iconic 1916 film The Battle Of The Somme performing the acclaimed score by Laura Rossi. In the first half of the concert, actors Jane, John and Martha Godber continued developing stories of soldiers in the Battalions of the East Yorkshire Regiment raised in Hull and their families left behind. The orchestra then performed Heroic Elegy by Ernest Farrar (who with a Leeds and Harrogate connection was one of the more local musicians to be lost at this stage of the War), The Lament by Frank Bridge(written for a young relative sunk on the Lusitania) and Music for Orchestra by Rudi Stephan, a promising German composer who was shot by a Russian sniper as well as Polonia by Sir Edward Elgar, which was written to raise money for the Polish victims. This concert was Part Two of the concert entitled 1916: The Grim Reality, the second of three concerts over four years reviewing music at pivotal stages of World War One. 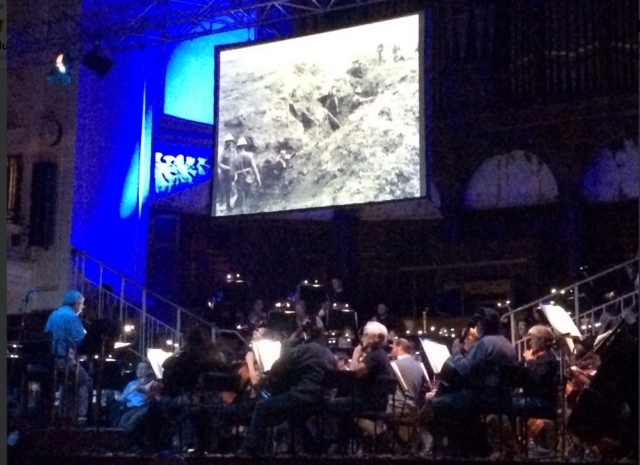 To mark the historical event’s 100th anniversary, The Battle of the Somme Centenary Tour comes to Hull City Hall on Saturday, November 26, in the form of Hull Philharmonic Orchestra’s The Grim Reality. The infamous battle was one of the largest of the First World War, lasting from June 1 to November 1, 1916 and at a cost of more than a million casualties to both sides. During this time an extraordinary documentary film was released. It showed the home front what life in the trenches was really like, with close-up shots of action on the front line. 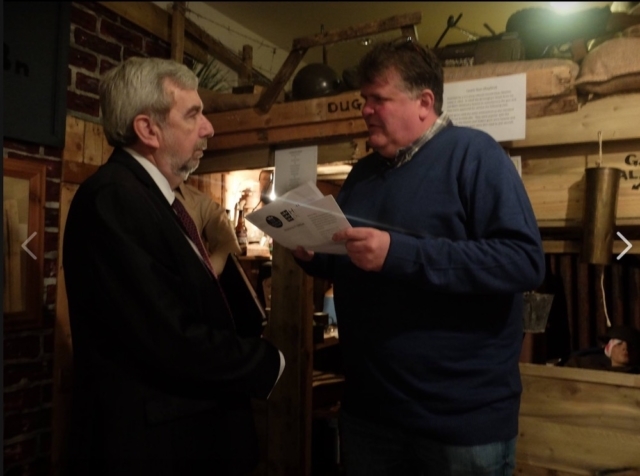 A century later and the film is being aired at various venues around the country as part of the Somme100 Film Project. We caught up with Musical Director Andrew Penny MBE to discuss his excitement at being part of one of the orchestras involved in the project. Firstly, can you tell us a little bit about the Hull Philharmonic Orchestra? 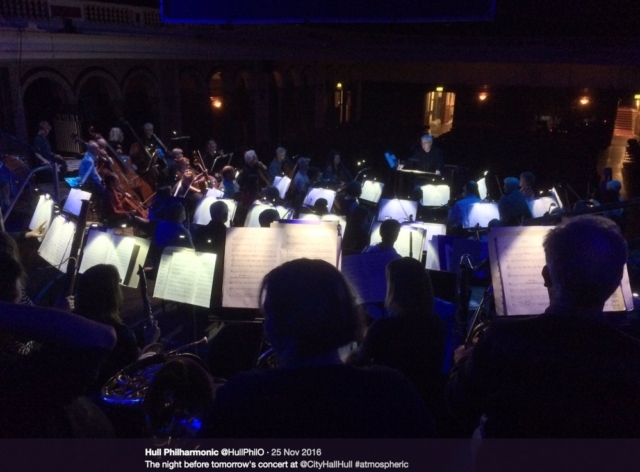 The Hull Philharmonic Orchestra was founded in 1881 and has been going for 135 years. We play three regular concerts throughout the season at Hull City Hall. An amateur community orchestra, we draw our 80 members from both local professionals and amateur musicians. We’ve grown quite a loyal following and play to an average of 730 people at each of our concerts. We sometimes go outside of Hull too; this year we played at Bridlington Spa and Leyburn in North Yorkshire. I’ve actually been doing this for 34 years now, making me the longest-serving Musical Director in the history of the orchestra! Wow, that’s impressive! So what exactly is The Grim Reality about? The Grim Reality focuses on the film, The Battle of the Somme, aired in cinemas across the country in 1916. The extraordinary black and white, silent film exposed the wartime public to the reality of life in the trenches. It had a huge impact on its audiences to say the least. We will be playing parts 2, 3 and 4 of Laura Rosi’s modern-day score. The music captures the mood perfectly as the regiments march optimistically to the front line, unaware of the grim reality of what would happen next. 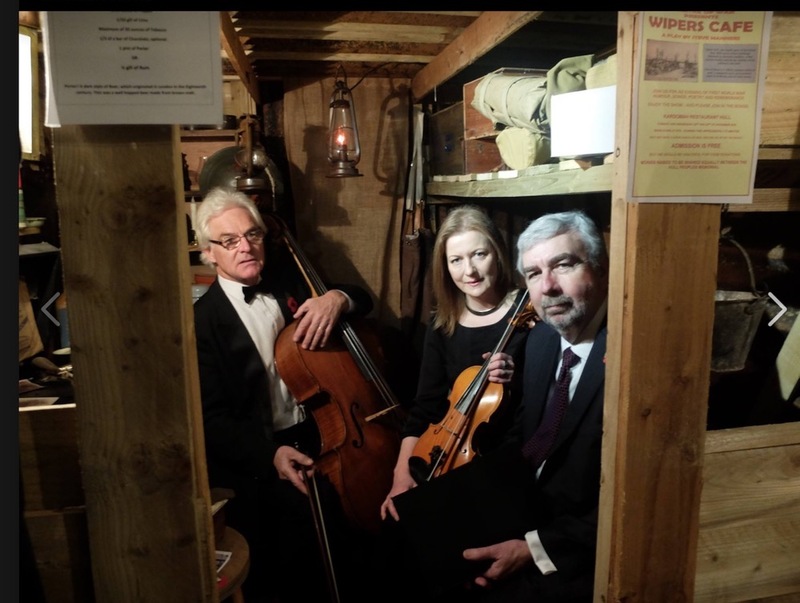 We also tie this in with music from musicians and composers such as Earnest Farrah, Sir Edward Elgar and Frank Bridge, whose lives were tragically cut short because of the outbreak of war. The music of German Rudi Stephan, who was killed in action, will be played by the orchestra, to remind people that there were losses on both sides. In the meantime, John and Jane Godber will be on screen, portraying several local soldiers of the East Yorkshire Regiment and their wives. They really get to grips with how their lives were impacted by the war. It’s very powerful because many of the people who fought during the First World War from this area would have signed up at Hull City Hall – it will be very moving indeed. It’s actually part of a series of shows that we are running to remember the First World War. In 2014 we began with 1914: Preludes and Premonition, which featured the words and music from the time and shared images from the war years. This year, we are memorialising the Battle of the Somme, and in 2018 we will conclude the series and celebrate the end of the war. However, by incorporating different forms of media, i.e. film and music, we are doing something very cutting edge. In short, why should people come to see The Grim Reality? The Grim Reality will appeal to a vast variety of people: those who may have lost family during the war, history buffs, film fanatics and those who love music. I think audience members will be pleased to see local people being remembered and memorialised during the performance. Just seeing The Battle of the Somme film itself will be fascinating for film and history enthusiasts. Meanwhile, the orchestra aims to present a broad picture of where music was during the time of the war. As well as where it could have gone if it weren’t for the deaths of budding composers and musicians. Plus, it’s very affordable, so it’s definitely worth a try if you want to see something a bit different. The Battle of the Somme Centenary Tour is coming to Hull. The remarkable documentary film from the trenches will be shown at the City Hall on November 26 when Hull Philharmonic Orchestra will play modern composer Laura Rossi’s score live. The Battle of the Somme film made a huge impact on the wartime public who for the first time saw close-up action from the front, including the bombardment of German positions and the deaths of soldiers going ‘over the top’. More than 20 million tickets were sold in the first six weeks after its release, making it one of the most seen British films in history. Now, a century later, the film, commissioned by Imperial War Museums, has been selling out again at venues around the country. 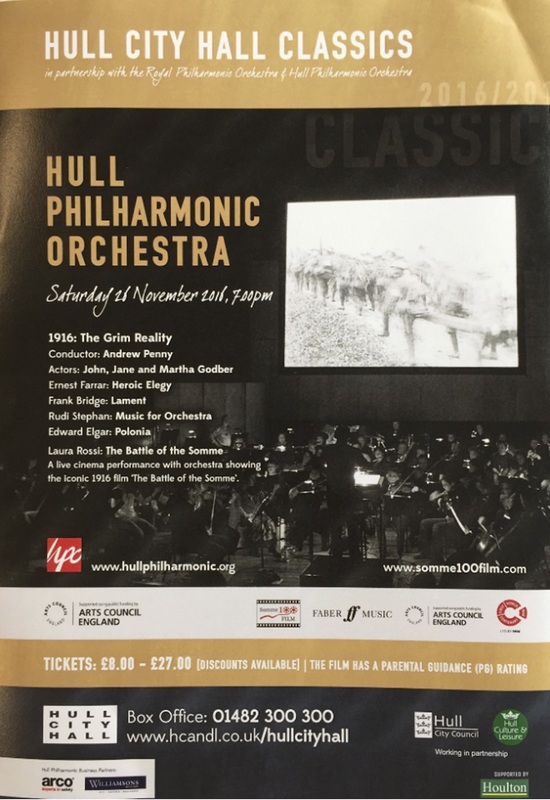 Entitled The Grim Reality, the Hull Philharmonic concert includes further film. In the first half, playwright John Godber with his wife Jane will recount the experiences of local soldiers and their families. 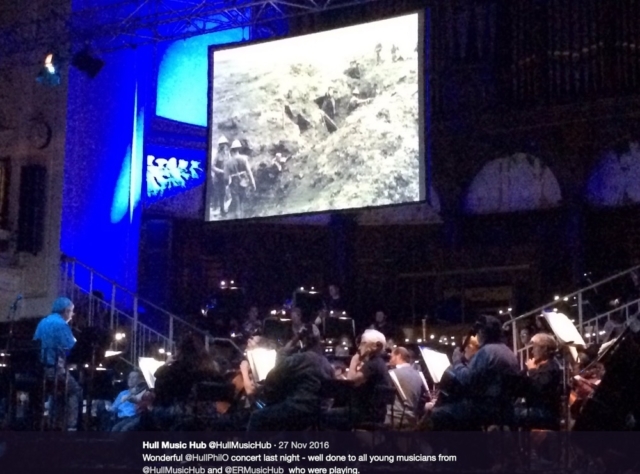 Their pre-recorded contributions will be shown on the screen above the orchestra, along with contemporary film, in a specially commissioned script recounting the activities of the East Yorkshire Regiment and those they left behind. Musical director Andrew Penny said it was a privilege to be part of the Somme100 Film Project and one of the 100 orchestras involved. “Laura Rossi is a renowned composer with credits for many well-known films and television programmes. She captures the mood perfectly – from regiments marching optimistically to the front to the grim reality of what happened next. “We are also playing music written during the war years by Sir Edward Elgar and Frank Bridge and works by Ernest Farrar from Harrogate, and Rudi Stephan from Germany who were killed in action. The centenary tour began at the battlefield Thiepval Memorial on July 1 this year with screenings at UK locations on the same day. By the time the tour concludes its year-long run, the re-mastered digitalised film will have been shown in the UK, Europe and across the world. The concert is supported by the National Lottery through Arts Council England and is the second of a series of three by the Hull Philharmonic over a four-year period reflecting crucial times in the First World War. Photographers Geoffrey Mallins and JB McDowell risked their lives to shoot The Battle of the Somme, which has a PG rating from the British Board of Film Classification. The full programme is: Heroic Elegy by Ernest Farrar; Lament by Frank Bridge; Music for Orchestra by Rudi Stephan; Polonia by Edward Elgar; The Battle of the Somme by Laura Rossi. The concert starts at 7pm.